Samsung has launched Galaxy A8 + Smartphone in India. Which comes with Infinity Display 6GB of RAM and Dual front camera. 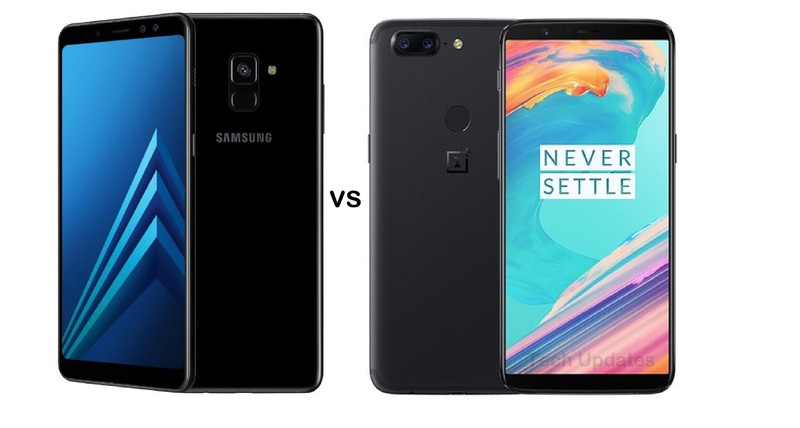 OnePlus 5T also comes with Similar Specifications. Check out Price, Specs, Features comparison between Samsung Galaxy A8 + and OnePlus 5T. Both Phones comes with Fingerprint Scanner on the Rear.On Display Galaxy A8 Plus has a 6.01-inch Full HD+ Super AMOLED display 18:5:9 Aspect ratio whereas OnePlus 5T has a 6.01-inch (2106 ×1080 pixels) Full HD+ Optic AMOLED 2.5D curved Corning Gorilla Glass 5 display. Galaxy A8 Plus is powered by Octa-Core Exynos 7885 14nm processor with 6GB RAM with 64GB of internal storage compared to OnePlus 5T which has 2.45GHz Octa-Core Snapdragon 835 64-bit 10nm processor with 6 and 8 GB LPDDR4x RAM and 64GB/128GB (UFS 2.1) internal storage. OnePlus 5T is Priced at Rs 32,999 for 6GB RAM and Rs 37,999 for 8GB variant.Samsung Galaxy A8 + comes in black, orchid grey, gold color priced at Rs 32,990 available on Amazon from January 20th. Galaxy A8 Plus offers Dual front Camera, Glass Body, IP68 rating whereas OnePlus 5 offers Dual rear Camera, Snapdragon 835 Processor.